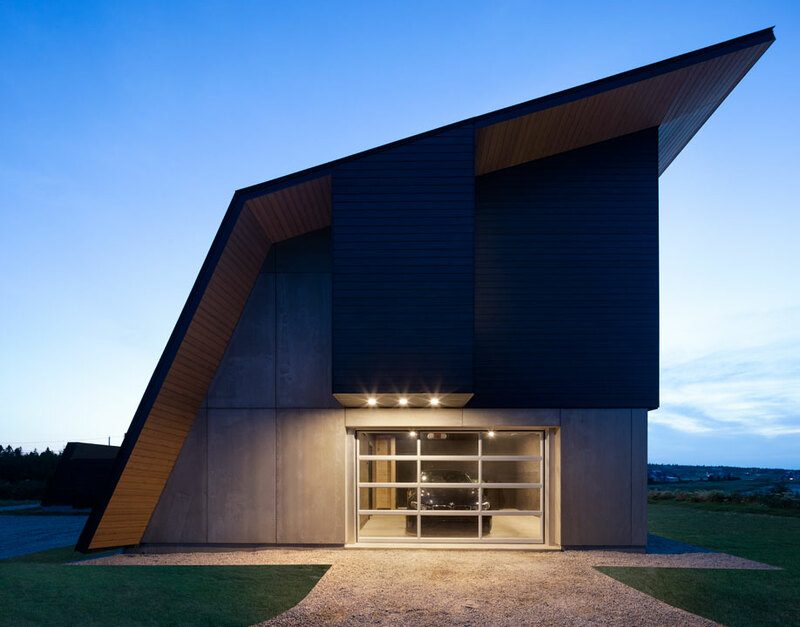 Featuring a dramatic black steel frame and concrete foundation, Omar Gandhi’s oceanside residence for weather-conscious clients in Nova Scotia is as secure as it is sublime. 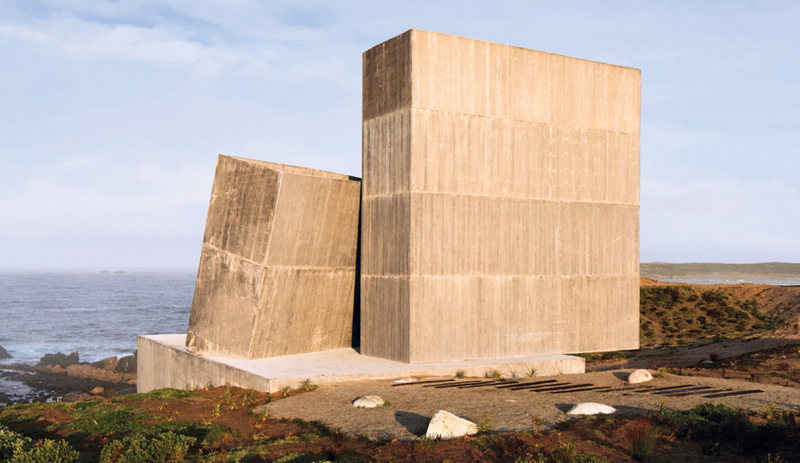 If it takes a delicate touch to transform mundanity into elegant architecture, then Omar Gandhi, whose practice is based in Toronto and Halifax, is undeniably deft. 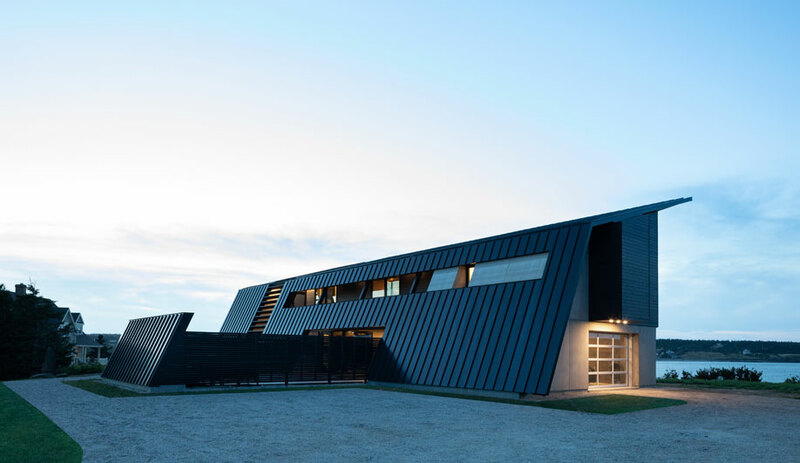 Eschewing a signature aesthetic, the architect prefers to interpret the history and context of every new commission, looking for clues – even in the minutiae of farmer’s fields and workers’ cottages – to inform his regionally specific yet showstopping designs. The results all look different from one another, but are supremely at ease in their settings. 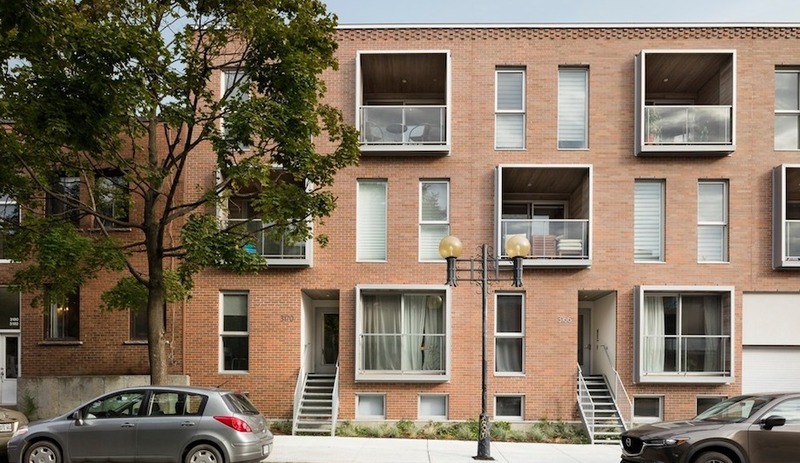 For Gandhi’s latest residential project, called Treow Brycg (Old English for “tree bridge” and pronounced Tro Bridge) in a nod to the homeowners’ British heritage, the point of departure was a gambrel-roofed barn. Gandhi took notice of one while driving to his clients’ site in Kingsburg, a quaint seaside village on Nova Scotia’s South Shore. He admired how the structure’s enveloping, canted roof was purposefully built to repel the torrents of rain common on the coast. “It reminded me of a frog, the way it’s hunkered down low to withstand the weather,” he says. 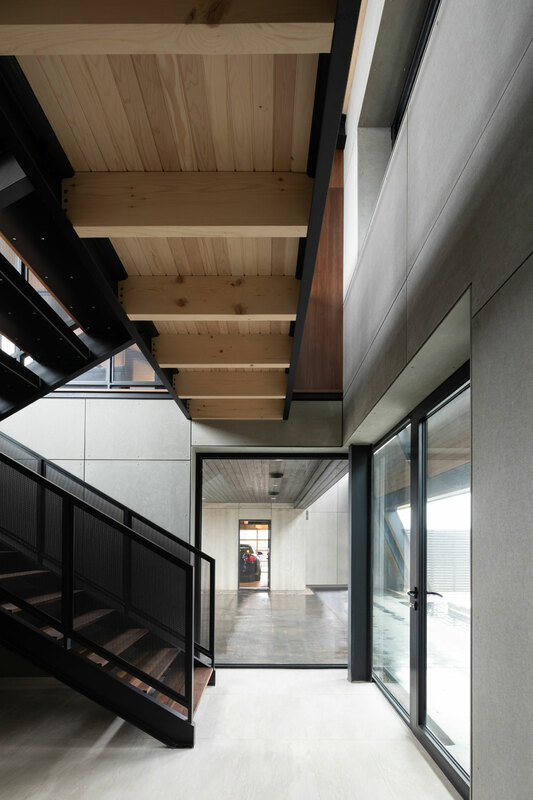 The house’s enveloping steel-and- wood frame is bookended by poured-concrete walls. 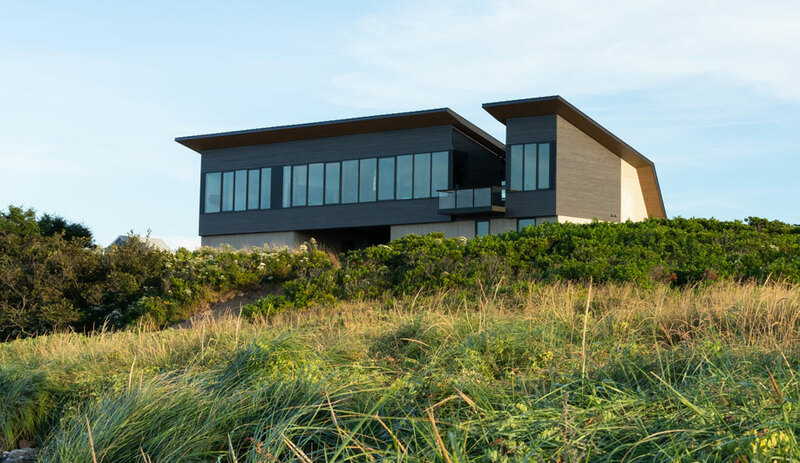 From the beach, the home looks less monolithic, its seaside face pierced by a gap in the structure and a row of hurricane-proof windows. 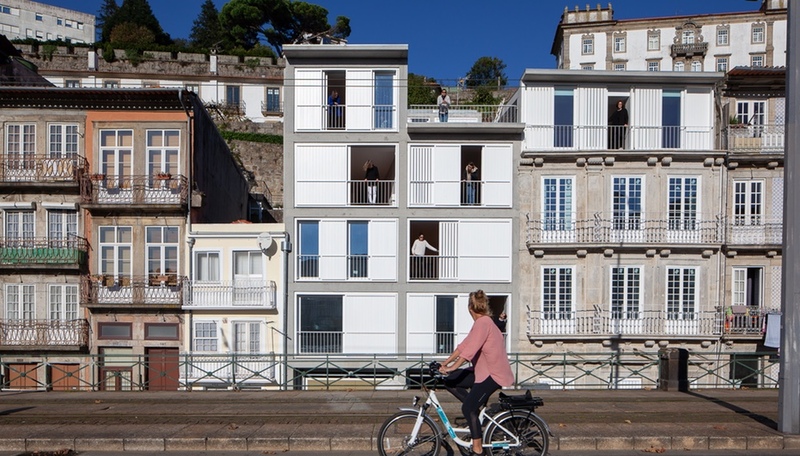 To imbue the 230-square-metre, two-storey abode with the desired sense of safety, Gandhi wrapped the top and road side of its solid, poured- concrete hull in a gambrel-like, black steel shell. Standing seams help wick away any precipitation. 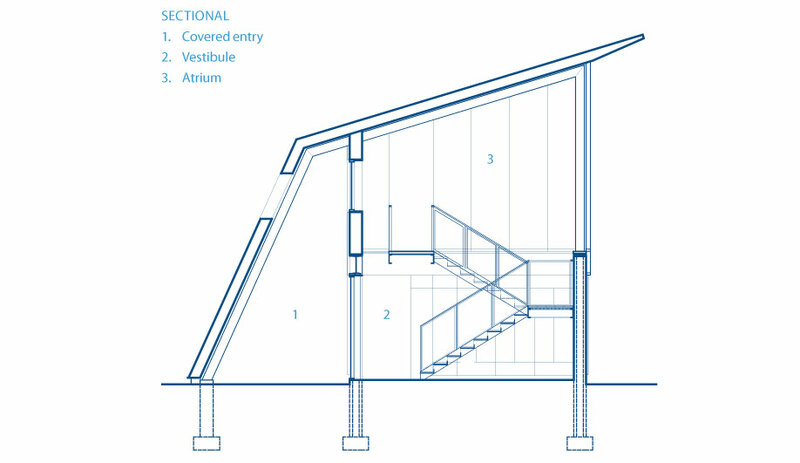 To provide maximum, umbrella-like protection, the roof covers not only the living areas, but also the ground-floor guest quarters and surrounding outdoor space. A glass-enclosed vestibule serves as the main entry to Treow Brycg. Switchback walnut stairs lead to the primary living areas on the second level. Gandhi’s progression of surprises and delights is evident at the threshold of the gap. What appears to be a solid concrete wall up ahead actually gives way to a glass-enclosed vestibule beckoning visitors indoors (either to the ground-level guest suite or up a set of switchback walnut stairs to the main living spaces). Guests who aren’t going inside, however, have a choice. 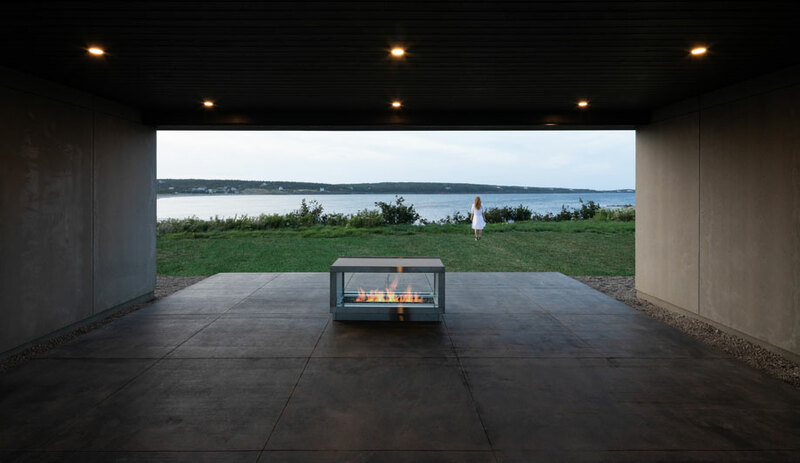 A gas fireplace punctuates the breezeway that cuts through the house. To the right of the vestibule, they discover that the veiled-in area contains an open-air pool and hot tub. To the left, they can sit around a glass-encased gas fire in a breezeway that cuts through the house and overlooks the Atlantic. Either choice is a sublime one, especially considering the pool is axial to the stunning view. 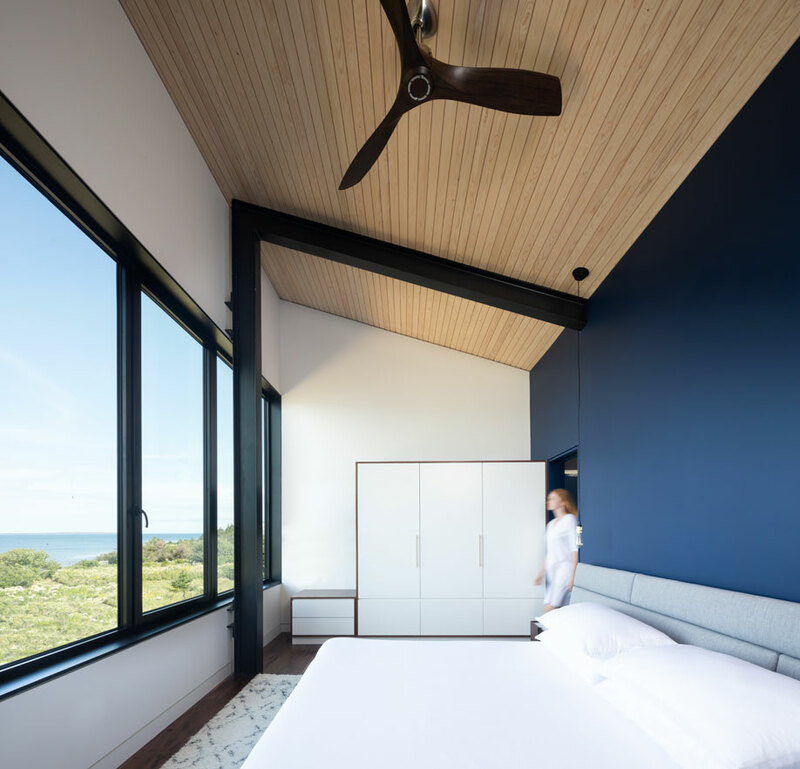 Plenty of light pours into the master bedroom, distinguished by a slanted natural- wood ceiling and cobalt statement wall. But perhaps the greatest surprise is inside, on the second level. 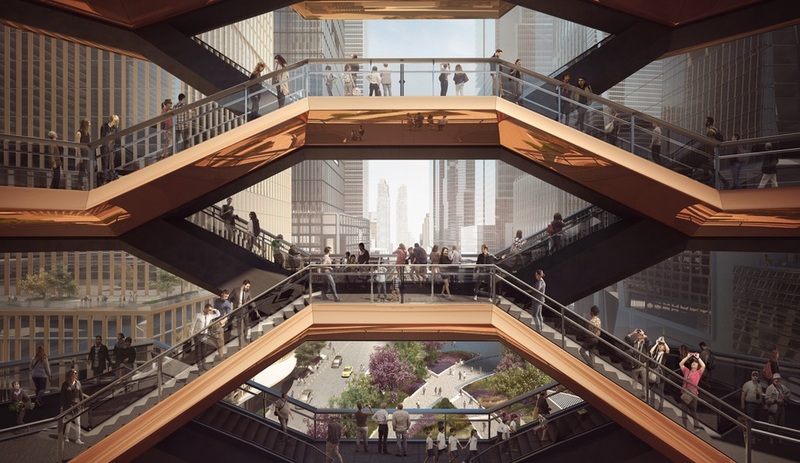 This is where the structure that seems dark and bunker-like from the outside shows itself to be capacious and full of light. 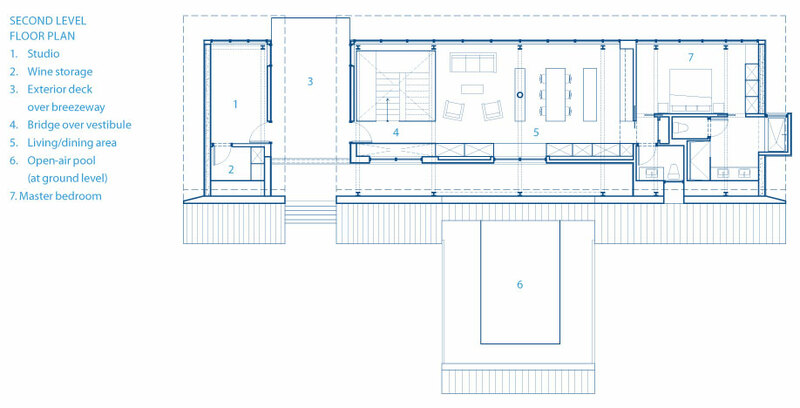 Wall-to-wall, ocean-facing windows (hurricane-proof, as requested) line every room, including the combined den and kitchen, the adjacent master suite and a small studio space separated from the rest by an exterior deck sheltered by a steel-fin brise soleil. Deep-blue cabinetry in the kitchen reflects the house’s seaside setting. A row of single-bulb ceiling lights hangs over the central island. To not distract from the vistas, the interior palette is spare, with walnut accents. 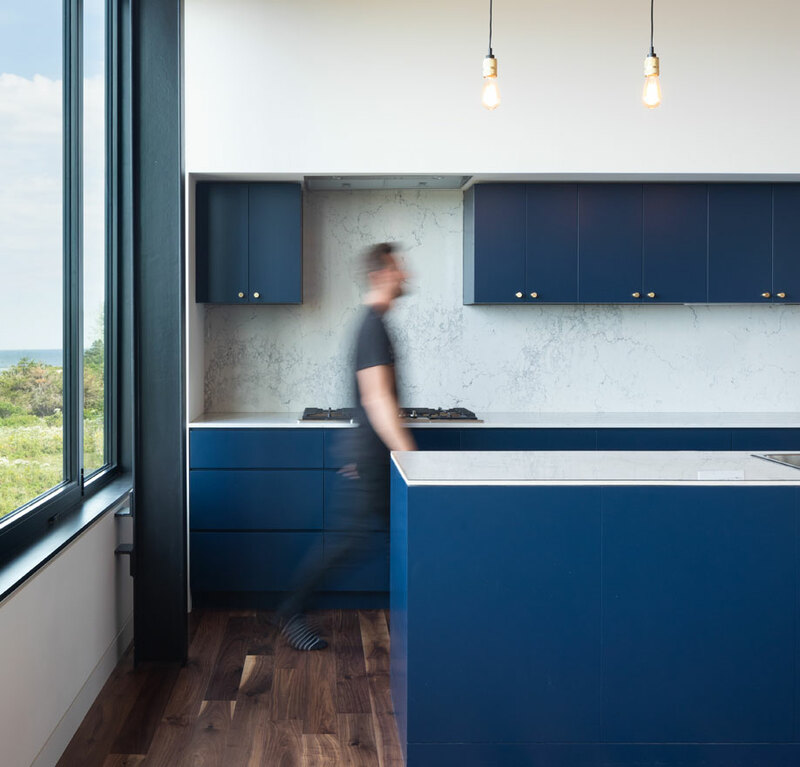 In a final dramatic gesture, though, the kitchen cabinetry and a wall in the master suite are a deep cobalt, complementing the richness of the walnut and reflecting the clients’ love of the water both in the Caribbean and in Canada. “I think it’s the first time we’ve used colour in a project,” says Gandhi, whose designs typically incorporate the natural or achromatic tones of wood, stone and steel. And there’s no telling whether he’ll use it again. It will all depend on what is right for the context.